Screen capture of the ESTC homepage. The following blog post identifies a disjunction in how the geohumanities spatial turn has influenced theoretical literature in print culture studies as compared to practical, bibliographic datasets. First, I provide an overview of recent literature in print culture studies and geography, noting an increasing theoretical interest in and understanding of the spatiality of the historic book trade, particularly the early modern English book trade. I then provide an overview of digital bibliographic databases, noting the absence of spatially relevant data points and structures. When contrasted with the abundance of spatial theories in print culture studies, the lack of geocoded bibliographic data can only be regarded as an untapped potential for print historians. By geocoding bibliographic datasets, print historians, I suggest, can develop new and exciting research opportunities for their discipline. the recognition of the materiality of the book means that it is an object that must have geography. Its making can be located and its movement can be mapped. Its history as an object is shaped by where it is made and where it can subsequently be found. This makes for many possible geographies. The material conditions of production and circulation of books take place on every scale from that of the printed page itself to global networks of trade and empire. For Ogborn and Withers, as for other print historians and geohumanists, the geography of the book constitutes not so much a new topic but rather a fundamentally new way of thinking about existing topics in print culture studies. Despite the increasingly theoretical understanding of the geography of the book, historians of early modern English print culture have been markedly slow to pursue bibliographic applications of such theories. In the specific field of early modern print culture studies, Blayney (1990) and Pantzer and Rider (1991) serve as the only concrete attempts to geo-reference and map bibliographic datasets.1 Blayney’s The Bookshops in Paul’s Cross Churchyard (1990) describes, locates, and maps the sites of the individual bookshops that proliferated throughout Paul’s Cross Churchyard in the seventeenth century. Likewise, Pantzer’s first and third appendices in volume three of the Short-Title Catalogue (1991) index and map STC entries by the address of their printer and/or bookseller. In today’s age of digital scholarship and web-based collaboration, it is a major drawback that both Blayney (1990) and Pantzer and Rider (1991) are published exclusively in print. 260|a London : |b Printed by Thomas Creede, for Tho. Millington, and Iohn Busby. And are to be sold at his house in Carter Lane, next the Powle head, |c 1600. Because of the way the imprint data is parsed in field 260, it is very difficult for a programmer to harvest the address information using any form of regular, field-based script. Evidently, the ESTC and similar bibliographic databases are designed to support queries about material books (e.g. outputs by year, author, region, etc. ), while the BBTI and similar databases are designed to support queries about people (e.g., stationers by year and region, output by stationer, etc.). No database currently exists [in 2014] that supports dynamic and complex queries about the spatiality of bibliographic information. It is high time that programmers, encoders, print historians, and geographers collaborate to develop a database (or series of databases) that geocode(s) the information that already exists in online resources such as the STC and BBTI. The need for such a database has been voiced by numerous scholars across disciplines and specializations (Black 79; F. Black, MacDonald, and J.M. Black 11; Gregory, Kemp, and Mostern 15; Howsam 57; Keighren 750; MacDonald and Black 507). Fiona Black, a print historian primarily interested in the eighteenth- and nineteenth-century Canadian book trade, proclaims that [t]here are dramas pertaining to the spatial contexts of print culture waiting to be explored [through the application of information technologies] (Black 109). In the field of early modern print culture studies, many of these spatial dramas take place in the city of London. A database that dynamically links information about London printers, publishers, booksellers, and printed books with spatial data points such as toponyms and geo-coordinates would undoubtedly uncover important, new research questions about the early modern book trade: What was the spatial distribution of printers, publishers, and booksellers in early modern London? How did this distribution change between 1475 and 1640? Were certain genres of printed books printed and/or sold in certain areas of the city? What was the median distance between where a book was printed and where it was sold? Such questions are of enormous relevance to early modern English print historians and demonstrate the significant potential of a geocoded bibliographic database. The following two blog posts will discuss what such a database might look like and how it might be created. Black, Fiona A., Bertrum H. MacDonald, and J. Malcom Black. Geographic Information Systems: A New Research Tool for Book History. Book History 1.1 (1998): 11-31. Black, Fiona A. Constructing the Spaces of Print Culture: Book Historians’ Visualization Preferences. Geographies of the Book. Ed. Miles Ogborn and Charles W. J. Withers. Burlington: Ashgate, 2010. 79-108. Blayney, Peter W. The Bookshops in Paul’s Cross Churchyard. The Occasional Papers of Bibliographical Society 5. London: The Bibliographical Society, 1990. British Book Trade Index. Dev. Peter Isaac and Maureen Bell. University of Oxford. Open. 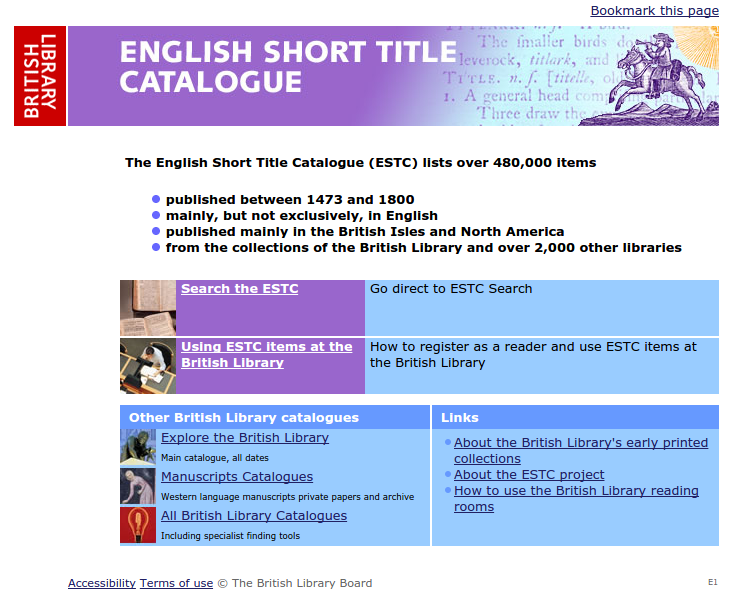 English Short Title Catalogue. British Library. Subscription. Fevbre, Lucien, and Henri-Jean Martin. The Coming of the Book: The Impact of Printing, 1450-1800. Trans. David Gerard. London: Verso, 1997. Gregory, Ian N., Karen K. Kemp, and Ruth Mostern. Geographical Information and Historical Research: Current Progress and Future Directions. History and Computing 13.1 (2001): 7-23. Howsam, Leslie. Old Books and New Histories: An Orientation to Studies in Book and Print Culture. Toronto: U of Toronto P, 2006. Keighren, Innes M. Geographies of the Book: Review and Prospect. Geography Compass 7.11 (2013): 745-753. MacDonald, Bertrum H., and Fiona A. Black. Using GIS for Spatial and Temporal Analyses in Print Culture Studies: Some Opportunities and Challenges. Social Science History 24.3 (2000): 505-536. Myers, Robin, Michael Harris, and Giles Mandelbrote, eds. The London Book Trade: Topographies of Print in the Metropolis from the Sixteenth Century. New Castle, DE & London: Oak Knoll Press & British Library, 2003. 21-43. Ogborn, Miles, and Charles W. J. Withers. Introduction: Book Geography, Book History. Geographies of the Book. Ed. Miles Ogborn and Charles W. J. Withers. Burlington: Ashgate, 2010. 1-28. Pantzer, Katherine F., and Philip R. Rider. A Short-Title Catalogue of Books Printed in England, Scotland, & Ireland and of English Books Printed Abroad, 1475-1640. Begun by A.W. Pollard and G.R. Redgrave. Vol. 3. London: Bibliographical Society, 1991. Raven, James. Bookscape: Geographies of Printing and Publishing in London before 1800. London: British Library, 2014. Richardson, Douglas, Sarah Luria, Jim Ketchum, and Michael Dear. Introducing the Geohumanities. GeoHumanities; Art, History, Text at the Edge of Place. Ed. Michael Dear, Jim Ketchum, Sarah Luria, and Douglas Richardson. New York: Routledge, 2011. 3-4. Turner, Michael, L., dev. London Book Trades Database. Oxford Bibliographic Society. Open. Landels-Gruenewald, Tye. Georeferencing the Early Modern London Book Trade: 1. Theory without Practice The Map of Early Modern London, edited by Janelle Jenstad, U of Victoria, 20 Jun. 2018, mapoflondon.uvic.ca/BLOG16.htm. Landels-Gruenewald, Tye. Georeferencing the Early Modern London Book Trade: 1. Theory without Practice The Map of Early Modern London. Ed. Janelle Jenstad. Victoria: University of Victoria. Accessed June 20, 2018. http://mapoflondon.uvic.ca/BLOG16.htm. Landels-Gruenewald, T. 2018. Georeferencing the Early Modern London Book Trade: 1. Theory without Practice In J. Jenstad (Ed), The Map of Early Modern London. Victoria: University of Victoria. Retrieved from http://mapoflondon.uvic.ca/BLOG16.htm.